Sometimes I feel like nobody really knows the real “me.” Ever since I moved to Argentina, I’ve been fitting in really well. In fact, I’m probably the most popular guy here. I’m having a great time laying out in the warm sun all day, enjoying the dry heat — I barely even have to worry about fungal disease these days! And at night, when it cools down, I can rest easy knowing that I’m ripening nice and evenly. When I’m at high altitude, it can be a bit of a challenge to get the nutrition that I need to thrive, but ultimately my hard work pays off as I develop more complexity. The laid-back, easygoing lifestyle here has made me soft and approachable, and I tend to get along with everyone I meet. But a part of me worries that I might soon forget where I came from. You see, life wasn’t always so easy for me. I grew up in the drained swampland of Bordeaux, where I began life as a very small fish in a big pond. There, while constantly battling difficult weather conditions to avoid disease or death, I contributed color and tannin to local blends — but I was never the star of the show. It’s not so much that I need the attention — I’m just an outgoing guy. So after a devastating frost in 1956 during which I lost 75% of my crop, I decided to focus my energy on my second home in Cahors, just southwest of Bordeaux. There, I changed my name back to Côt, and alongside Merlot and Tannat, I began to shine, as I had been respectfully replanted by those who appreciated me. Meanwhile, back in Bordeaux, they decided they were better off without me, and these days you’ll rarely find me back in my former home town. I’m not bitter, I swear — really, I wish all the best to my old friends Petit Verdot, Merlot, and the brothers Cabernet. I know they talk behind my back about my susceptibility to coulure and downy mildew, and my lack of maturity in colder years — but if I have to be in a blend with them, I’ll be perfectly cordial. I set down roots in Argentina back in 1868, when I was brought over by a French agricultural engineer who recognized my potential. Life was always comfortable there, but it wasn’t until the late 20th century that I “went viral,” effectively becoming the national grape of my adopted homeland. I’m happiest living in Mendoza, but I’ve made my way throughout the entire country. Wherever I go, I am always well-received by locals and foreigners alike! 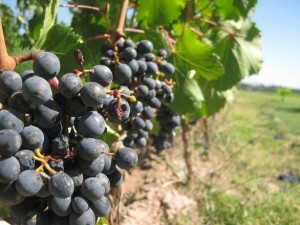 Malbec: Did I find God in the vineyards?